Following the success of the original VoomPC automotive computer case, the VoomPC-2 quickly became our new customer favorite. It’s easy to see why. The new features of front USB and audio I/O, two case cooling fans, plus the option for a slimline optical drive all add to the case’s versatility, as well as consumer appeal. I recently checked out several other online reviews on this automotive PC case. 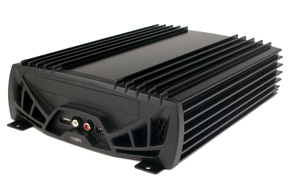 Most reviews pointed out the thick, rugged aluminum outer shell of the case, the intelligent automotive power supply (M1-ATX – 90W or M2-ATX – 125W) that prevents the computer from draining your battery when the car is not running, and the fact that the entire PC’s power consumption is less than that of your parking lights. I had assumed to find comments such as these, which focus on all the features that would appeal to anyone interested in installing a PC in his/her car. I did happen upon one Web site that did not give such a rave review for the VoomPC-2. The writer claims that the two cooling fans located in the front of the case do not provide sufficient cooling for the hot-running motherboards such as Pentium M and Core 2 Duo models. However, the writer’s basis for this theoretical problem leads me to believe that he never bothered to assemble a system for testing. It was stated that the VoomPC-2 featured one intake fan and one exhaust fan, both located in the faceplate of the case. Having this setup, the two fans “probably” would not create good air circulation toward the rear of the case. I’ve been building car PCs with this case for several months now, and I have yet to come across one in which the two front case fans are not both intake fans. The heat generated by the hardware is forced out the small vents in the rear of the case, or out the front of the case between the two intake fans. The test software we use here at Logic Supply includes a stress test that runs the CPU at full speed for 60 minutes. In my experiences with this case, the cooling fans in the VoomPC-2 have proven more than adequate for even the Core 2 Duo motherboards that we carry. With that in mind, no one should worry about cooling issues when building a VoomPC-2 with a Pentium M mainboard. Here are a couple things you might want to keep in mind if you’re assembling your own VoomPC-2 system. Use Ultra Low-Profile RAM modules, and optimize your cable management. You can run out of space really fast due to the presence of the hard drive/CD drive mounting tray. You’re probably best off using a SATA hard drive, because the cables are easier to pack in place. 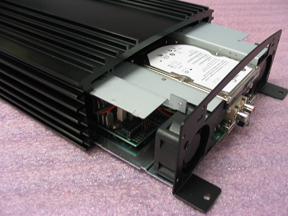 Also, assemble the system drives and components exactly as you want them, then slide the base plate and drive tray into the aluminum enclosure all at the same time. You’ll find that cables and wires will want to shift around a lot if you try to install the drive tray after the base plate is already in place. After all the hard work is done, you should be pretty happy with the finished product. It’s sleek and durable, and the mounting tabs will hold the whole assembly in place wherever you choose to bolt it down. We have a number of different mainboards and add-ons available for the VoomPC-2, so you shouldn’t have much trouble finding a setup that fits your specific needs. See Logic Supply’s Automotive Systems section for more information. ARTiGO: What, Where & How? What size are the cooling fans, do you stock replacements? The cooling fans are 40 mm: http://www.logicsupply.com/products/mb40201v1. Hope that helps!